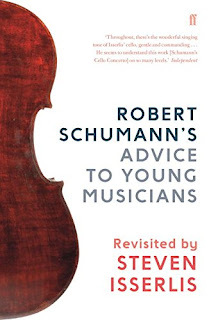 Robert Schumann produced his Advice to Young Musicians in 1848 to accompany his Album for the Young. Now cellist Steven Isserlis has produced his own version Robert Schumann's Advice to Young Musicians Revisited by Steven Isserlis (Faber and Faber). In this delightful little book Steven Isserlis has reprinted Schumann's aphorisms and added his own commentary. It isn't so much a bringing Schumann up to date, in fact much of Schumann's advice is both timely and timeless, but providing a modern interpretation and humanising touch. There is a wit, charm and wisdom to Isserlis's comments which means he really does bring this rather daring enterprise off. Isserlis has re-arranged Schumann's aphorisms into chapters, On Being a Musician, Playing, Practising and Composing, and then adds a short chapter of his own advice on these topics. The whole makes sense as a modern commentary on Schumann, but it also provides a very practical guide to being a musician in the 21st century. Isserlis starts with a lovely piece on the benefits of musical education, and other nuggets include his comment 'I don't know of any musician who does not enjoy an enthusiastic reception (even if they pretend not to; but it must not be the main goal' on Schumann's aphorism about wealth. And I love Isserlis's comments on Schumann's 'Never popularise bad compositions', when Isserlis temporises, living in the world where composers might write pieces for you which you don't like yet you feel obliged to perform. In an apposite commentary on Schumann's injunction for a composer to get to know the instruments, Isserlis agrees that composers should not torture performers unnecessarily then adds the story about the first cellist to play Schumann's cello concerto wanting to have the last movement re-written (Schumann ignored him), and the Isserlis mentions his own telling of Thomas Ades that a piece he had written for Isserlis was just too difficult (before going on to give the premiere). Steven Isserlis's own short chapter starts with the invaluable advice 'The most important thing as you enter the music business is to vow NEVER to lose our love for the music itself'. This is a book which wears its learning and wisdom lightly, and makes a charming and informative read. It should be essential reading for music lovers everywhere.